I pack no provisions for my long journey---entering emptiness under the midnight moon. My "nature pictures" are a family joke. There will be a landscape of some sort, and then I must point to a black dot, vague and nearly invisible. That dot might be an owl or a dolphin...perhaps an eagle, a fox. All my nature pictures looks the same, because of the dot. The answer to my problem is simplicity itself: I need a telephoto lens...but it remains a low priority item somehow on my wish list. This summer we were visited by the white blur you see in the photo here displayed. I shot nearly half a roll on this creature, and I guess this is the best I could do. This is a tufted titmouse...but all white. It's some kind of hybrid, rather than an albino I think. They have large black eyes, and this one did too...rather than pink or red that one associates with an albino. Unless something is different with birds---and it may be---our feeders were being visited by a rare variation. Dana nicknamed him Ghost Bird, which underlined a forboding I felt about how his version of titmousedom was going to fare in Nature's evolution. I think he was male, given the kind of flash and dominance he showed at the feeders. The titmouse is a friendly, even social bird. They sometimes gather as a group for an afternoon birdbath. They can be coaxed to sit on your finger to take a sunflower seed. But I've never thought of them as particularly playful or showy. This one is---or was. A tufted titmouse is essentially a gray bird, with brief rusty sides and whitish breast and underparts. This bird was all white and dazzling as it would fly in from the green woods for a seed or two. Titmice eat insects mostly, but come for seeds and a drink of water at least once a day. Ghost Bird was surprisingly aggressive, chasing off cardinals and mourning doves for a perch. The brilliant whiteness probably helped him learn to try that stuff. His speed would startle even a larger, more dominant bird. The bravado was fascinating. I began to identify with him, not because I've ever had the moxie to try these behaviors socially myself. His style interested me, because I'm sure that were I in his clutching feet I'd be hiding all the time. It seemed impossible he could survive long with such radiance in the forest. Titmice are fast, but no match for a cat on the ground. I've seen a sharp-shinned hawk swoop into a gathering of feeding birds and sit there for a second---before the rest of them even know he's there. Surely he'd see a white bird like that and go for it one day. And yet Ghost Bird showed no fear...instead exulting in every moment Life gave to him. And he brought at least this one observer such joy and beauty. But we went away last week...and so the feeders became quickly empty. The birds would have to go to the ground to forage seeds that had fallen. I'd never seen Ghost Bird on the ground...and I don't know whether he tried it. I do know I haven't seen him in the few days we've been back. Hopefully he just moved on and will discover the feeders are full again and return. Or maybe he didn't make it...in such angelic glory. In Nature such brilliance seems a target. He was so different from the jolly but rather drab others of his species. He brought a message for me right through Nature itself that is almost religious. He seemed aware of his difference and used that whiteness to express a special energy and exuberance. In his brief life, if that is how it turned out, he taught me something wonderful about how to live. I try to follow Ghost Bird's example. To see the beauty in the moment for we know not the hour of our demise. if a titmouse got caught by anything, they are so fast and agile. I saw someones slinky tabby in my yard trying to catch birds, not having much luck though. She was so engrossed in trying to catch them she didn't see me walk up behind her til i got within about ten feet. She took off with a look of sheer guilty terror, heheh. Seems like quite a find there jazz, and who knows, you may have found a new variety. My auduban field guide shows a black crested variety native to texas and oklahoma that looks a bit lighter, but the crest is definitely black. Maybe a molting thing? I've heard that in nature, white is a danger signal meaning leave me alone. i like watching them feed on the hanging feeders people have, they hang upside downlike the nuthatch. Maybe some sunflower hearts will tempt her back. It's probably too early for suet. jmarc (I know spiritseek is...as usual) but I beg to differ about titmice and cats---at least our cats. When a pile of feathers is brought to the door---guilty gift?---and that happens pretty regularly, it's a titmouse. I know about the western variety...and this was not molting. (Pity the poor mess cardinals turn into every summer.) I thought I saw a flash of white in the woods off our deck yesterday afternoon. Ghost bird. Why is it whenever I read your latest "sharing" a tune comes to mind? Hm? Surely it is your name (jazzolog), your love of the music and your vantagepoint which is always right on, hip and wonderful...even if you are talking about the birds and the bees. Funny, I had just recieved, via the U. S. Post Office, a letter from a pianist: Vinnie Gerard, who had sent me the music of an original tune he wrote for Charlie Parker called YARDSTICK. I was waiting to get online and saw your email at the same time...you won out...so the tune waits. Welcome back from vacation. After 12 years of living in California, by the Marina Del Rey Bay, my daughter has moved back to North Caldwell, New Jersey. Sad in the beginning of no longer enjoying 'spectacular' sunsets, she is now in thrall with feeding the birds. At first I thought she was losing it, not so. I too am adicted to her latest quest to recognize each and every one who visits. She had been told to try to do it at the same time every day. And she has...and there are deer, a racoon, 9 chimpmunks, 10 squirels, 8 morning doves...always in pairs, one crow, some sparrows and a cardinel...the father. But one day, as if out of a dream, we saw something white...keep in mind we are in New Jersey; it seemed to dart into the bird bath, flutter a bit on a dog day in August and fly straight away. We looked at each other and thought the same thing: Who? What and Why? I have no idea what we saw but when I read about your sweet bird I just wanted to share. 1 Sep 2004 @ 07:03 by jazzolog : Ghost Bird Lives! The white titmouse returned to our house for sure yesterday. My sighting was confirmed as non-hallucinatory. He was moving around the eaves troughs, where of course various insects have parties and stuff. He did not go on the feeders...but then the other titmice haven't much either. I wonder if they change diet slightly when autumn begins to show signs. Perhaps the purity of the Bush twins at the Convention encouraged his resurrection. 1 Sep 2004 @ 14:34 by dempstress : Hurrah! It could be your Spiritual Guide, young Richard. More of the sort of thing we expect to see on NewCiv! If nothing else it ought to do for any remaining Wax Moths. I have just had my wasp's nest expunged by our local Terminator, but not before one of the little darlings gave me an infected sting which nearly landed me in hospital. The bee's nest, however, is humming along nicely. On Sunday Septmeber 2nd. we were working outside and saw something fly by that looked rather funny. 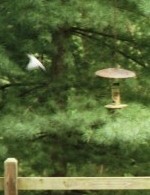 It landed on the Hummingbird feeder and we saw it was a White Hummingbird. At first the other Hummingbirds were afraid of it, then they all ganged up on it and ran it off. We thought we would never see it again, but Tuesday morning early it was back at the feeder again. We got a picture of it, but couldn't get close enough for the picture to be very clear. Ila's fascinating observation inspires my melancholy duty to report the white titmouse didn't make it through last winter...and no such other bird showed up this summer. He too had been the object of derision by "normal" titmice and I doubt got to mate. I marveled that he made it as long as he did with the number of cats and sharp-shinned hawks in our woods. Unlike last fall however, the birds that come to our feeders really have been chowing down and packing it in, requiring me to refill every day. Perhaps the moisture in the seeds is part of the attraction, given the searing heat and drought that besets our area. a harsh winter to come? NCN member silviamar, a chemist living in Spain, has sent me a number of articles showing the Gulf Stream is slowing to a near halt. That's one of the effects of lowered salinity, I guess, from increased fresh water provided by melting icebergs and glaciers. The Gulf Stream brings Scotland milder winters to which you are accustomed. The first warnings I saw about this were issued 20 years ago. Some say without the vitality of the currents, the Mediterranean will turn into the Dead Sea.